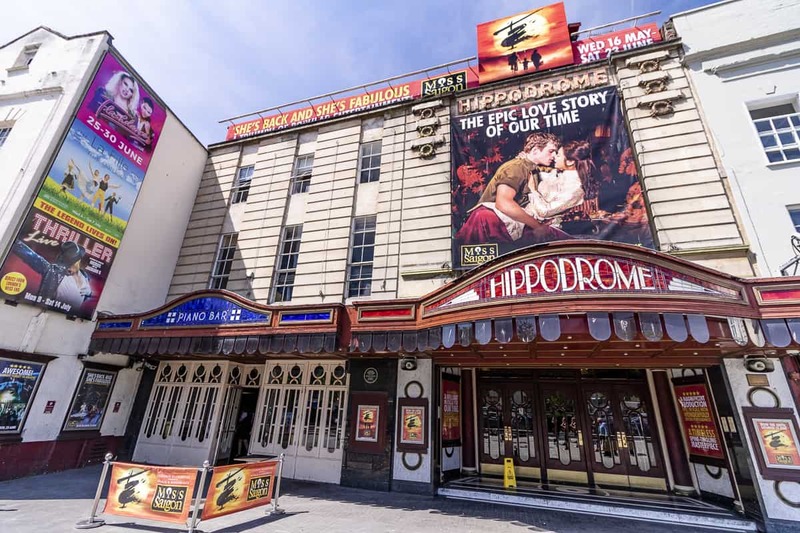 Taking an audience on an emotional journey back to 1970’s Vietnam is no easy feat, but the phenomenal production of Miss Saigon currently on tour in the UK transports us there in the most thoroughly enchanting way. In eager anticipation for the show’s arrival at the Theatre Royal Plymouth, we took a trip to The Hippodrome in Bristol, where we got up close and personal with the magic thanks to a behind the scenes tour, where we got to see the astonishing ways that the cast and crew are able to transform every regional theatre they visit into the most atmospheric scenes of South East Asia. Our tour starts as the crew are hastily resetting the stage, ready for the matinee performance that we are set to see later in the afternoon, but the work started much earlier on. To turnaround all of the costumes in time for the next show, the laundry team were in at 9am getting the wardrobes prepped for the numerous changes that take place throughout the show. 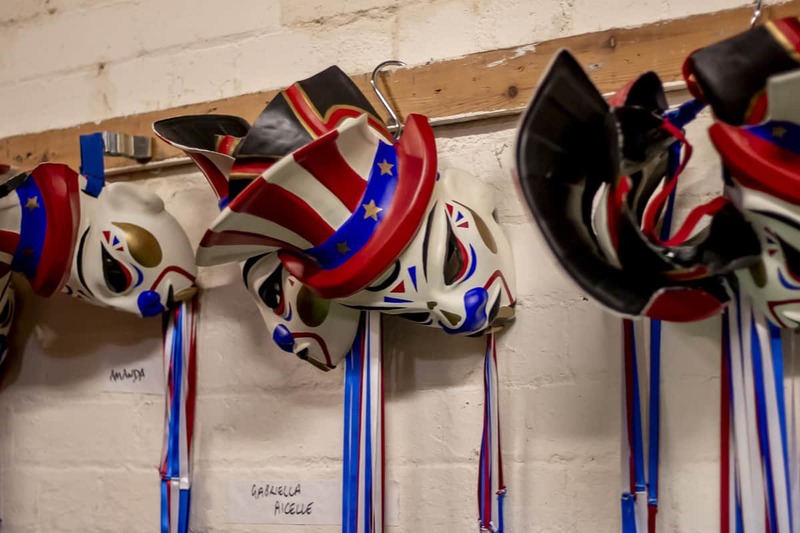 With a touring cast of 35, the quick changes in the wings are planned out meticulously so that the swing performers can effortlessly switch from American G.I.s to Vietnamese street traders in next to no time. 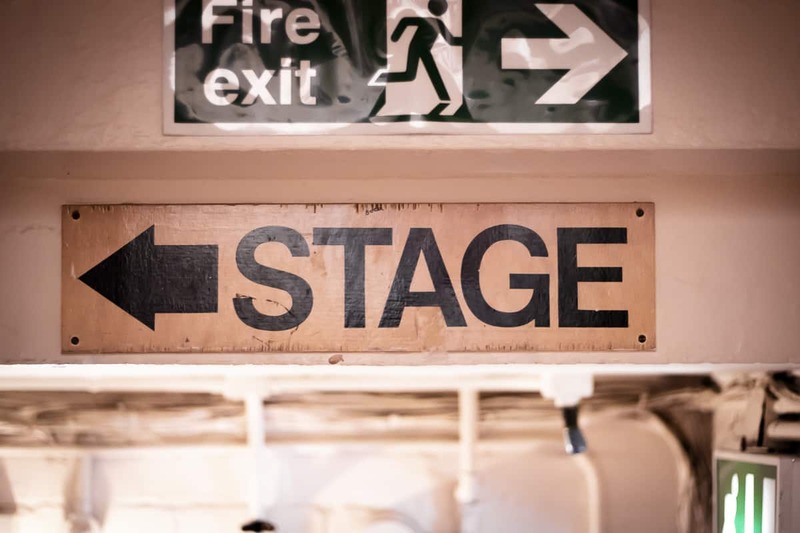 As we are taken through the wings towards the wardrobe area, we squeeze through the narrow spaces between the breathtaking scenery trucks and props that are carefully set out beside the stage. 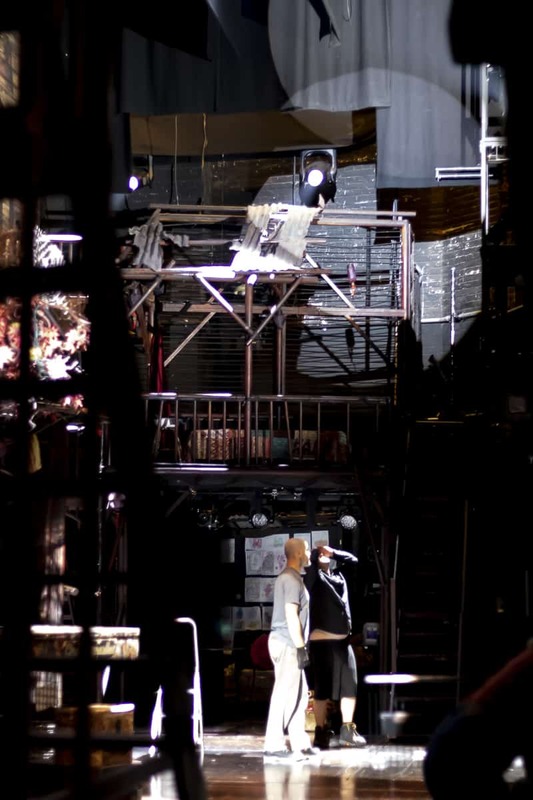 Each side of the stage are the two main trucks that form the towering main setting for the first act, giving a grand sense of the architecture of Saigon at the time, moving throughout the show to change the stage from back streets, to nightclub, to embassy, and more. 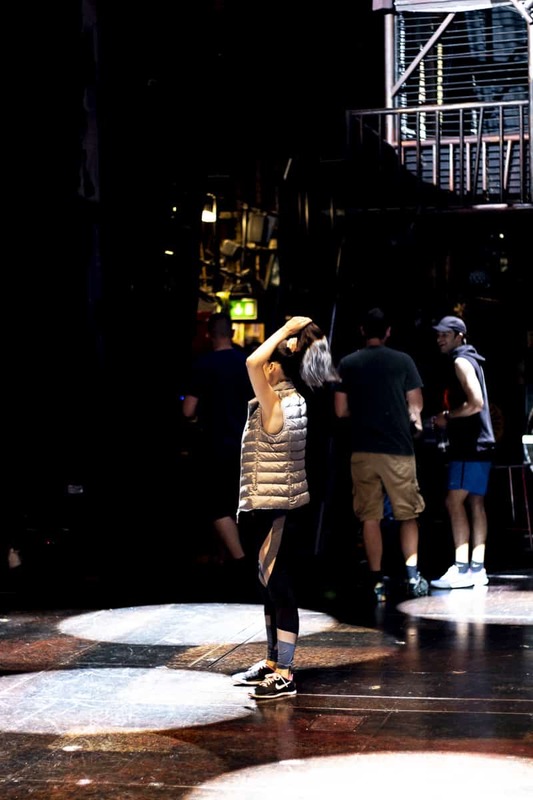 Stepping through, we are shown just how much of the wardrobe and props need to be ready at the side of the stage for super-quick turnarounds. The space is so limited that there’s even a Cadillac hoisted up overhead until it is needed! The fast-paced and energetic parts of the show, especially around the final moments in Saigon, require quick changes of costume and scenery. To facilitate this, there is a 10 strong dress team and a wig team of 5 behind the stage throughout the show. This lets a humble cast of 35 portray bustling streets, marching armies, and fleeing refugees in a truly authentic and captivating way. With the stage crew, lighting teams, and everyone else working hard throughout the show, there are up to 115 people backstage at any one point in the performance! The authenticity and attention to detail is what makes this touring production such a success. Yes, the show itself is an emotional rollercoaster that tugs on every heart string, and tells a story that will last with the audience forever – but what makes this hit home is how genuine the atmosphere feels. The captivating story is given a true sense of reality thanks to the care and attention taken in finishing the scenery, the acquisition of the genuine US Marine uniforms from the conflict for costume, and the exceptional use of the stage lighting and sound to give an astounding depth to an otherwise standard stage. 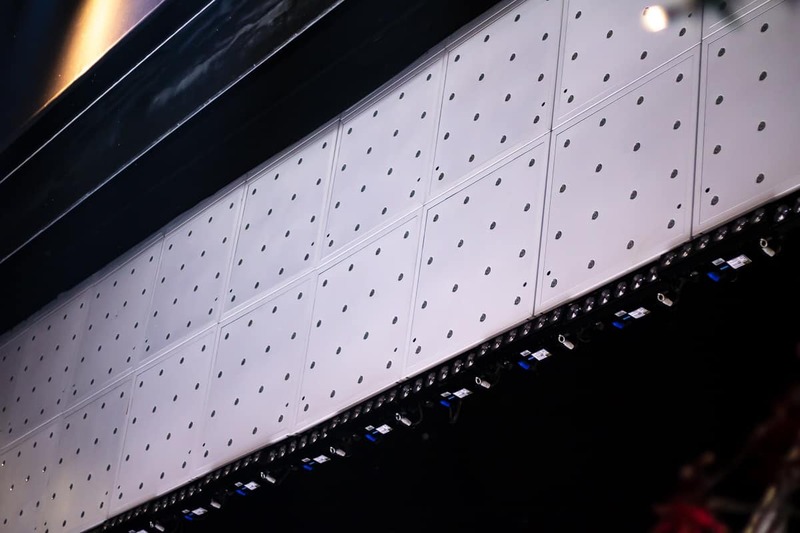 When we were taken to the deepest depths of the backstage area, we were shown the state of the art LED backdrop that is used to create the alluring skies and warm lighting that create the tropical nights and balmy dawns of Vietnam and Bangkok. Throughout the show this backdrop is used to give a subtle sense of time passing, as well as the dramatic shifts in location and time. But it’s not all flashing lights that make this show great. 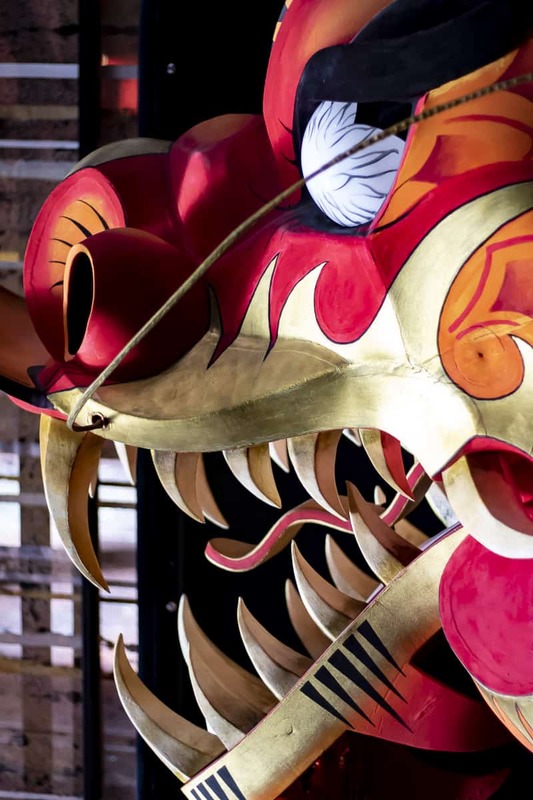 Having the opportunity to get up close to the costumes, props and scenery let us see the true detail that is present in every part of this production. 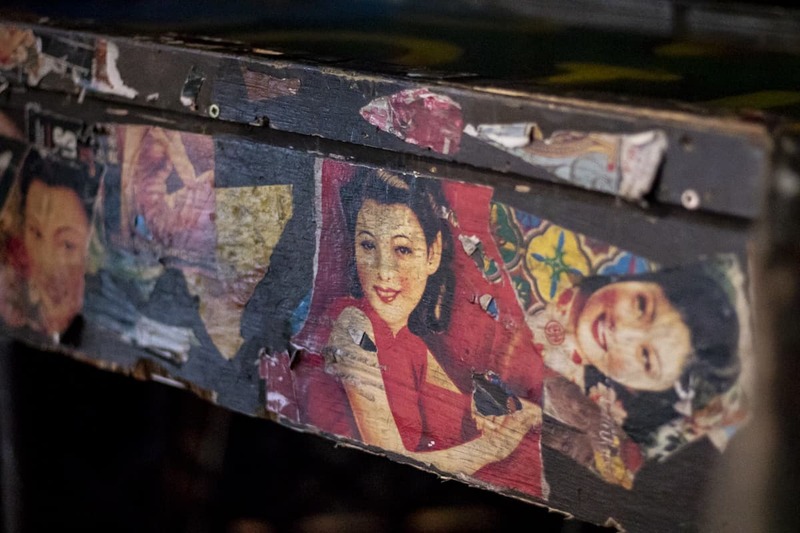 One of the key locations in the performance is Dreamland, a seedy bar and brothel in Saigon under the management of the infamous ‘Engineer.’ Getting hands-on with the scenery truck that forms the main bar, we were shown the decoupaged posters and cutouts that had been stuck onto the surfaces, with even the torn edges and dog-eared corners planned. 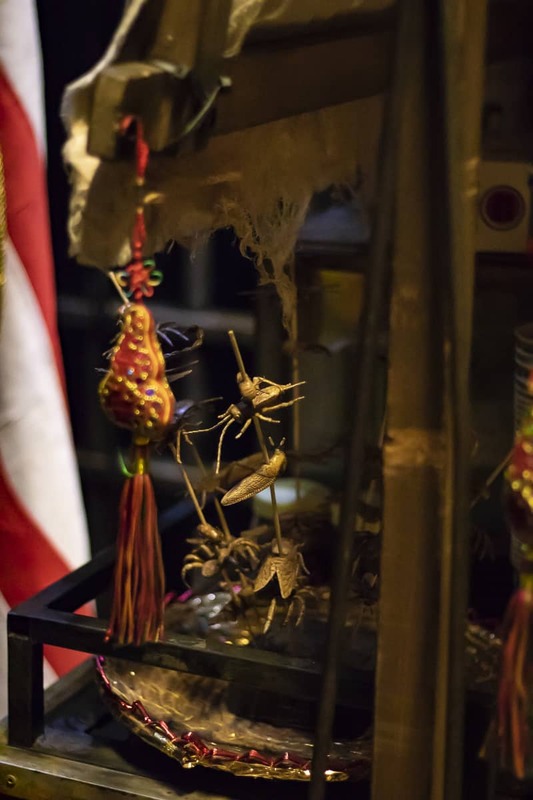 The details are considered throughout the set, from the small objects, such as skewers of fried insects on the street food stalls for Bangkok, to the larger scenery surrounding the stage in front of the curtain and proscenium line, drawing the atmosphere close to the audience. Even more enigmatic parts of the set design add a sense of place – particularly Kim’s dressing room scenery, complete with the Vietnamese words for “I am beautiful” written in red lipstick on her mirror, a personal reminder for her the darkness of a club on Bangkok’s back streets. Of course, there is no escaping the element of war that the entire story centers around, and the sensational way that the theatre feels invaded as the last chopper out of Saigon enters is heart-poundingly phenomenal. The sheer sense of scale in such a pivotal moment in history within a theatre is beyond memorable, achieved by the descent of a true to life Huey helicopter! All in all, being shown the backstage workings and up-close detail that goes into such a breathtaking piece of musical theatre gives me an even greater sense of appreciation for this magnificent work of art. From every single aspect of the art direction, through to the meticulous planning and adaptability of the backstage crew, and of course the talent and passion of the cast themselves, it is no wonder that such a spectacular show stays with people for a lifetime. Don’t miss your chance to see this memorable show from Wednesday 4th July to Saturday 4th August in The Lyric, Theatre Royal Plymouth.